The pretty country town of Young, about 3 hours drive from Canberra, is known for its beautiful cherries in spring. Many Canberrans make an annual trip to Young to pick their own cherries, or buy boxes of them at a very reasonable price. 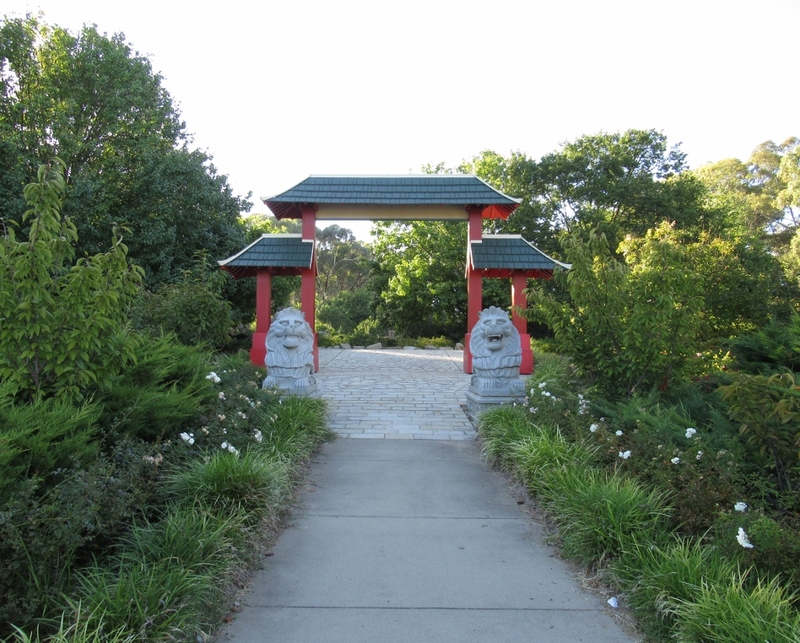 However, our visit was not for cherries (this time), we came to see the Chinese Tribute Gardens at Lambing Flat, on the outskirts of Young. The name Lambing Flat came from the first European settler, James White, who farmed in this beautiful valley, in 1826. He reserved this well-sheltered valley for lambing ewes. Within 12 months of the discovery of gold in the Lambing Flat region, approx. 20 000 gold seekers, from all over the world, arrived, and amongst them were some 2000 Chinese miners. Disagreements arose over the use of water, land ownership, and racial tensions…leading to an appalling riot destroying the Chinese camp and injuring many of the Chinese miners. A large contingent of NSW police were sent to Lambing Flat, and eventually peace was restored. 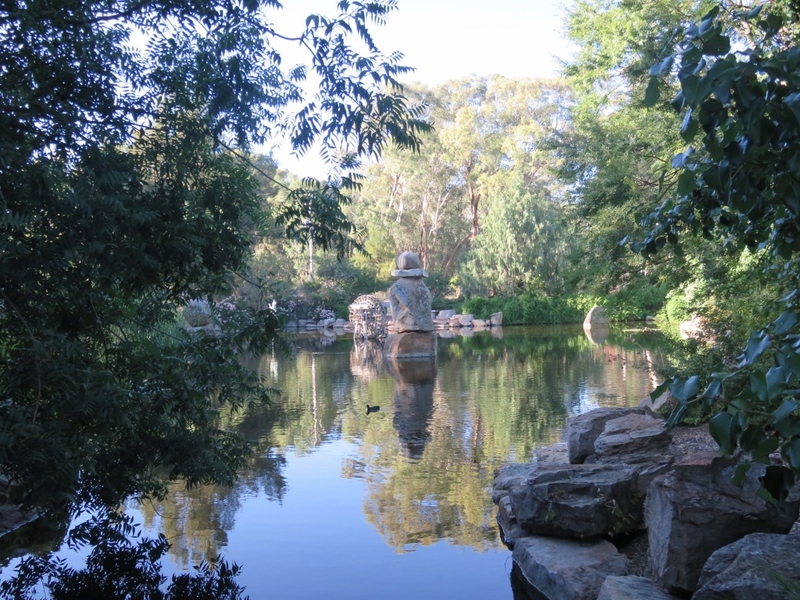 With this history in mind, we arrived at the Chinese Tribute Gardens early in the morning. 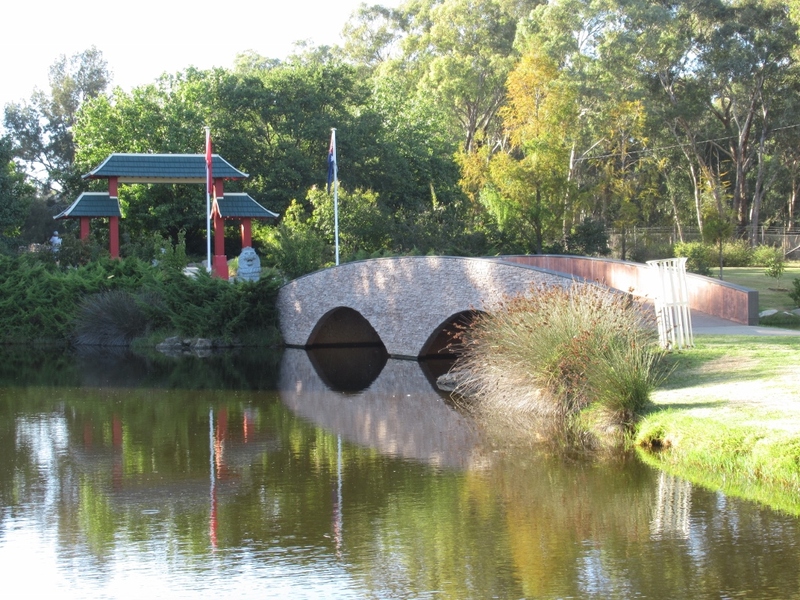 This garden has been designed and built in recognition of the contribution of the Chinese community to the settlement of Young. 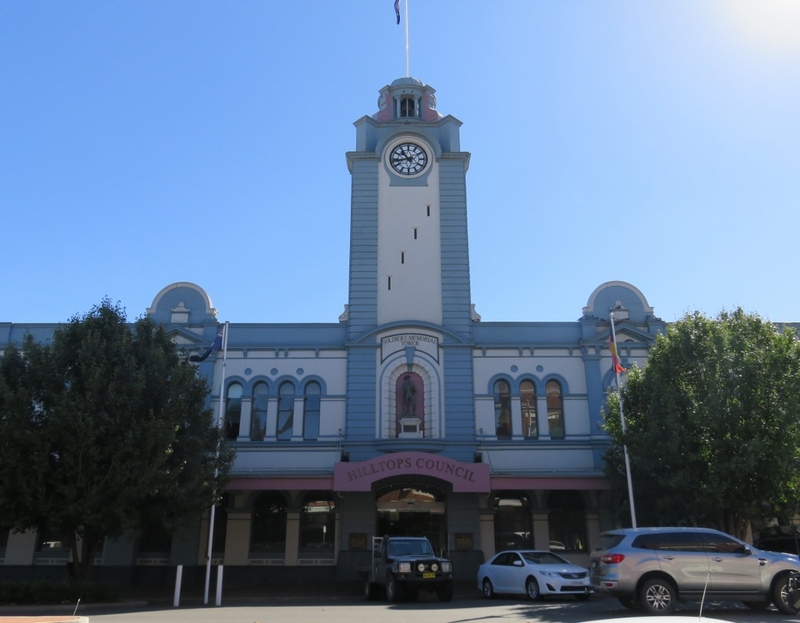 It has been a true community effort, started by the Young Rotary Club, supported by local and regional businesses, grants from the Federal Government and the Cherry Festival and by the Sydney Chinese community as well. A White Egret, a Sacred Ibis, and two very white ducks! It is a warm morning with birds moving softly, reflected in the still water.. The gardens are ringed by bushland, and She-Oak (Casuarina) trees in the distance provide a wind break for this beautiful garden. The Bronze Galloping Horse is a special feature in the garden. Known as the ‘Matafeiyan’, or “‘galloping horse stepping on a flying swallow”. It is modelled on the original which is preserved at the Gansu Province Museum in China. 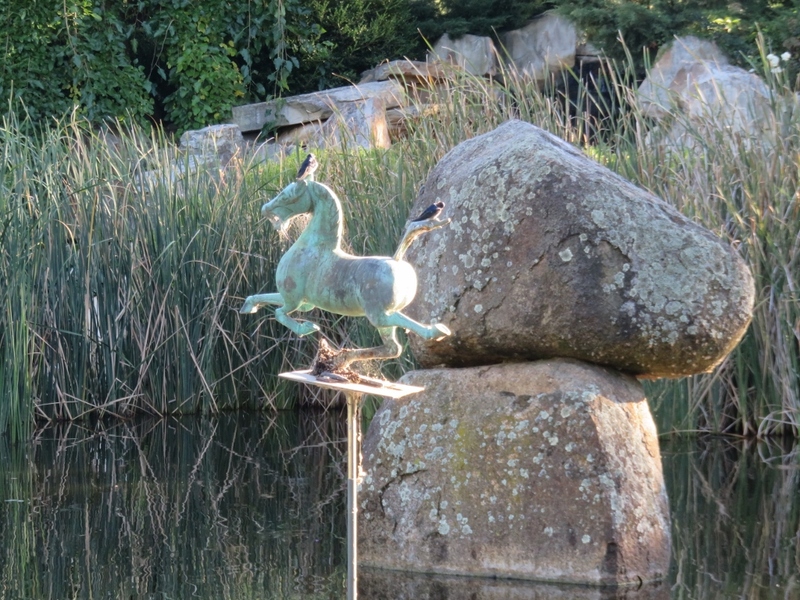 In this peaceful setting the Galloping Horse may be galloping on a flying swallow, but is also a resting spot for early morning birds.. 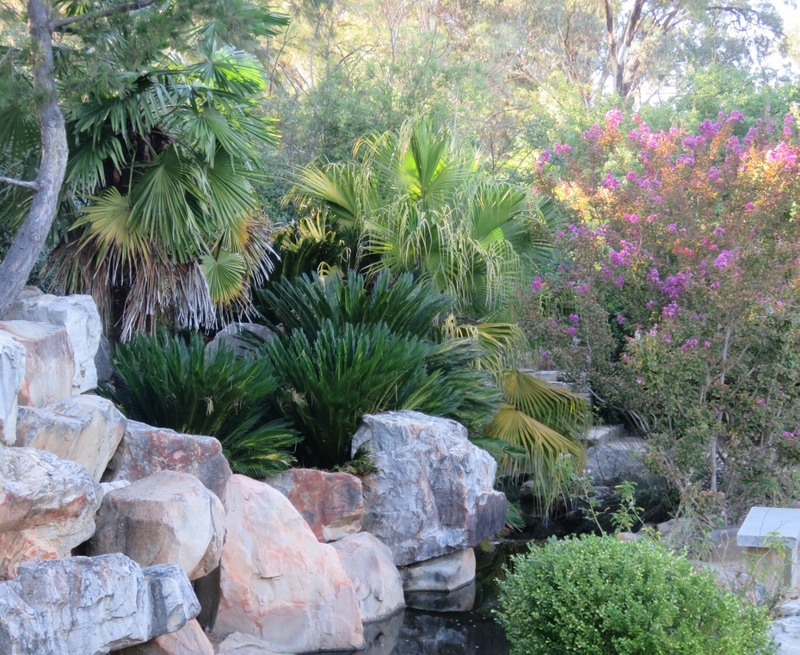 The Crepe Myrtles and Oleanders are all in flower… and the palms seemed perfectly placed between the rocks. 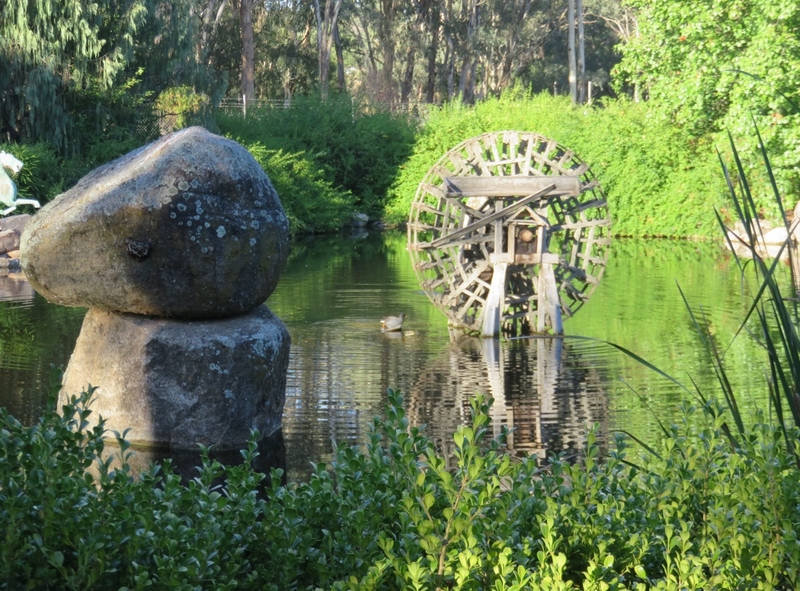 In this pool of tranquillity the rocks provide balance and harmony. 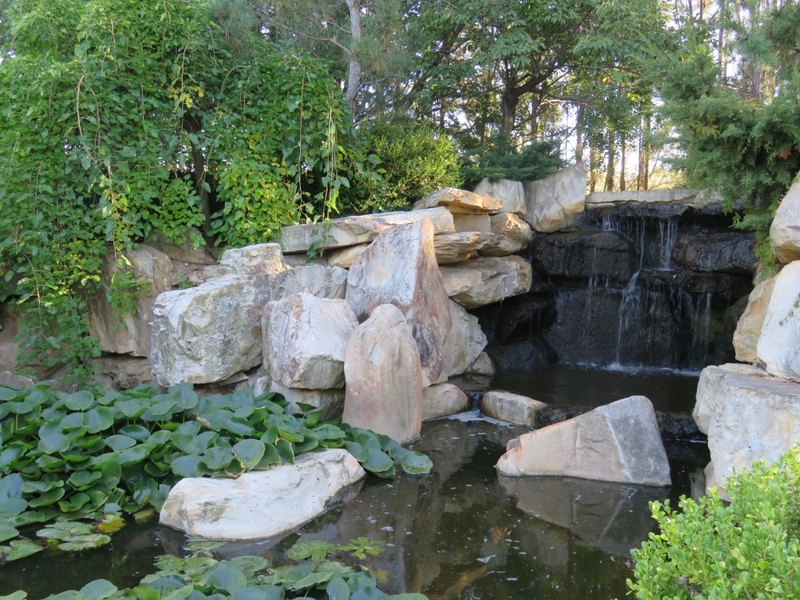 There are winding paths around the rocks, and benches, inviting us to sit and enjoy the plants, the birds, the water and reflections…a lovely way to spend a morning. Lambing Flat, a beautiful valley, had experienced the worst of human behaviour during the gold rush. Now it has been transformed by all the people in the community and beyond, coming together to build this quiet and peaceful place….a joy to visit. 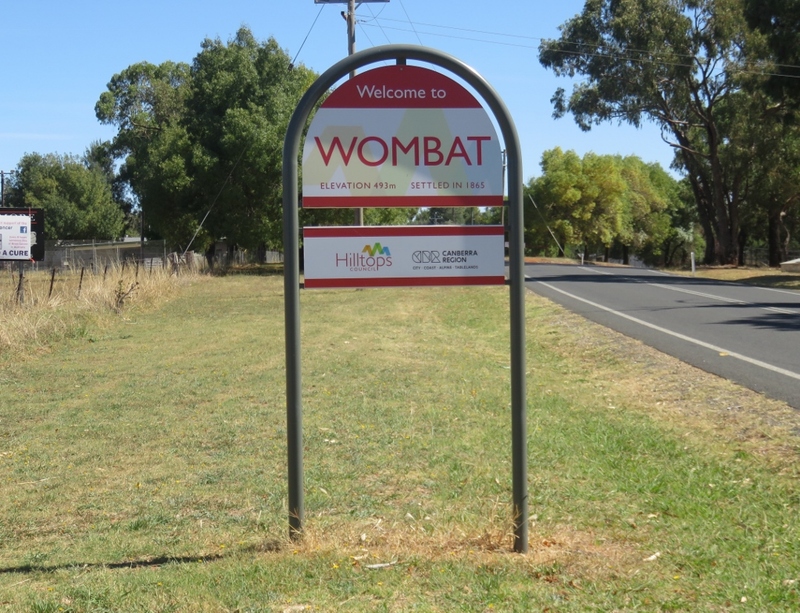 However, on our way home we couldn’t resist stopping at the town of Wombat. 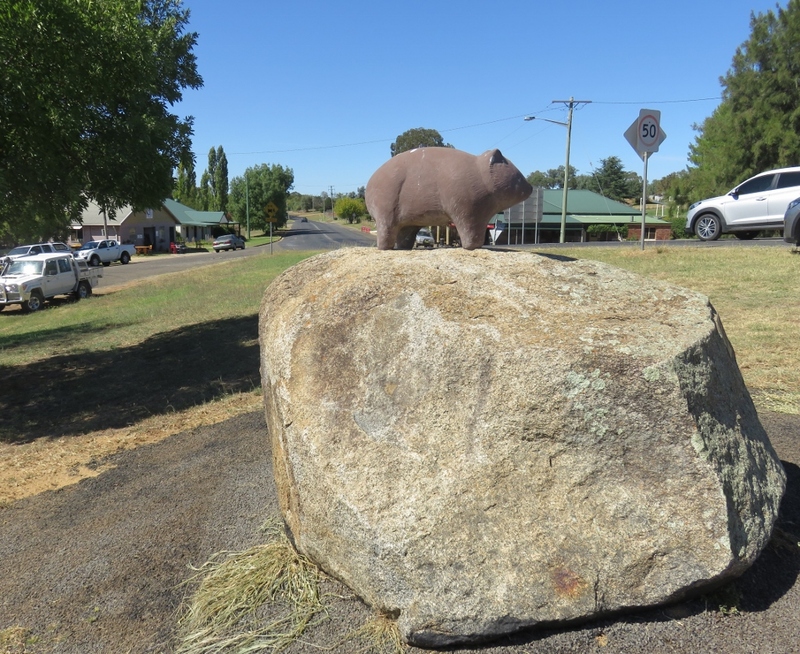 Also established during the gold rush, Wombat has a population of 120 people (no parking problems) and is surrounded by cherry and stonefruit orchards. 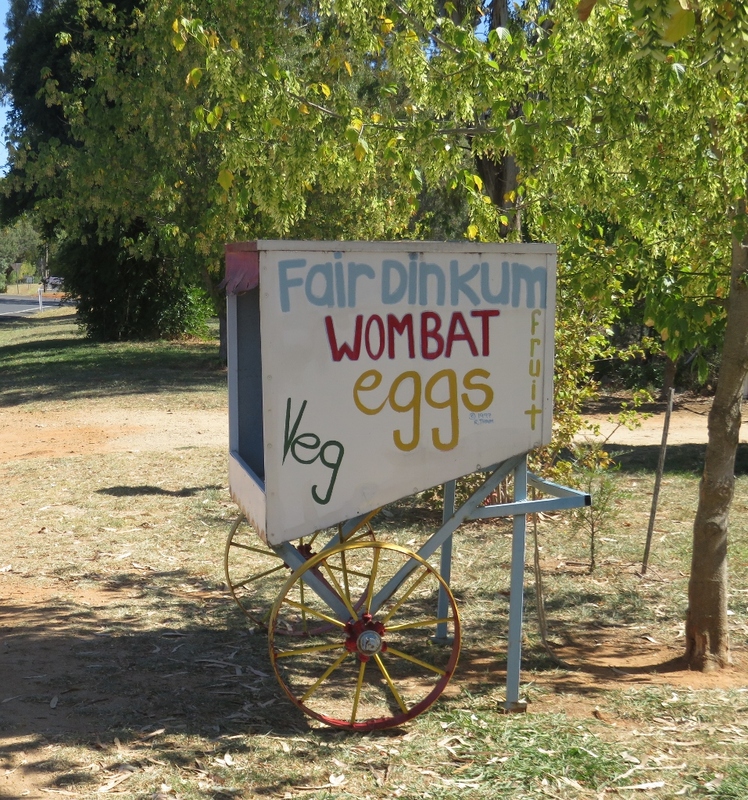 We stopped off to buy some “Fair Dinkum” eggs. 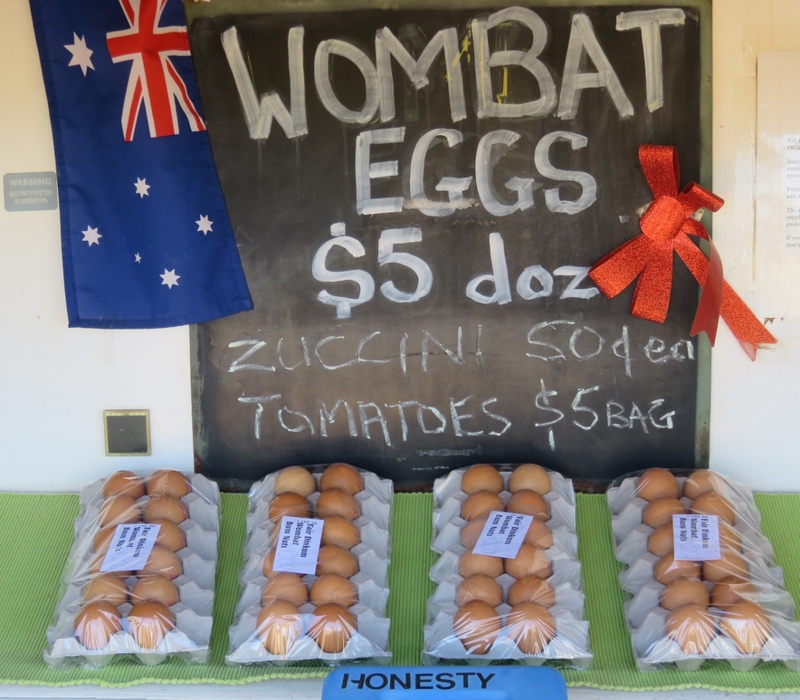 (Fair Dinkum….the real thing)… freshly laid farm eggs. We put the money in the Honesty Box, and hoped that life will remain the same in this part of the world for many years to come. I hope you are enjoying your place in the world, where ever that may be…we enjoyed this weekend very much. Many thanks to Paul for his photo contributions. 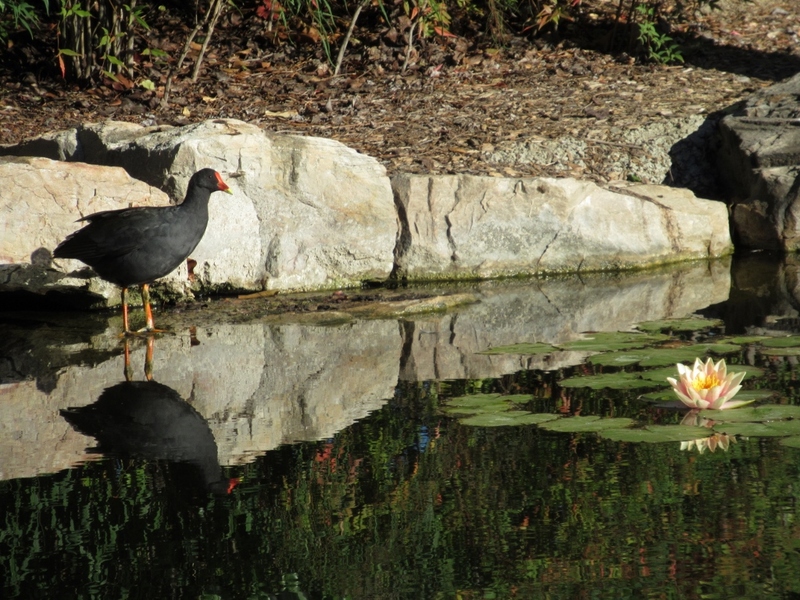 This entry was posted in New South Wales Gardens and tagged cherries, Duck, Gold Rush, Lambing Flat, Mark Twain, Moorhen, Sacred Ibis, The Chinese Tribute Gardens, Whiter Egret, Young on October 14, 2018 by germac4. What a peaceful place well illustrated by excellent photographs. I thoroughly enjoyed scanning slowly through your post. I also loved the fact that ‘honesty boxes’ still work. bravo Australia! Thanks Susan, and yes, isn’t it lovely to see an Honesty Box still in use! Just making sure that I get future posts. It looks well worth the drive, Geraldine. I love the rocks. What a beautiful place. Thanks for sharing. Yes, I thought the rocks were really stunning too, especially around the water’s edge. It’s a lovely garden. Ahhh, Sacred Ibis. I remember them from the Royal Botanic Garden in Sydney. 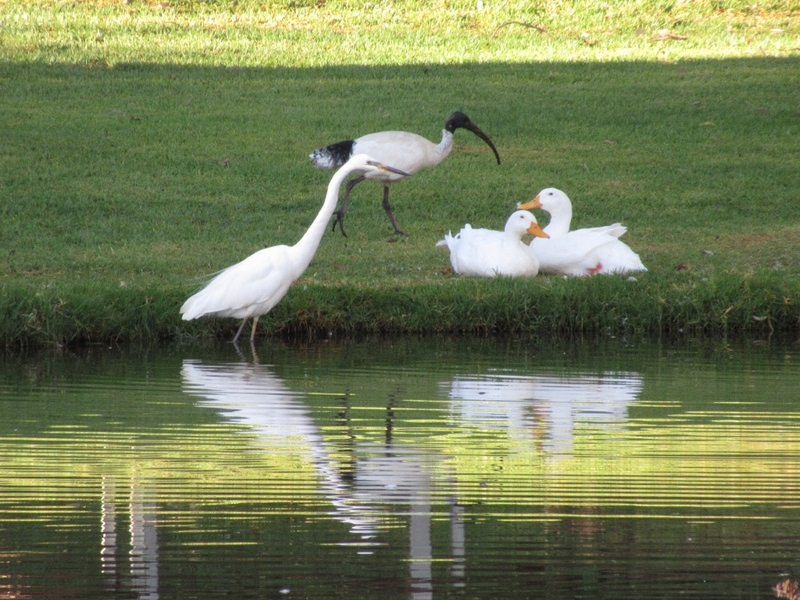 I don’t know what the Sacred Ibis was like when you were at the Royal Botanic Gardens, but they have become a real pest around any foodie places in the garden. A beautiful, beautiful place. It shows that a violent place can become peaceful. A good lesson. Yes, I totally agree Laurie. 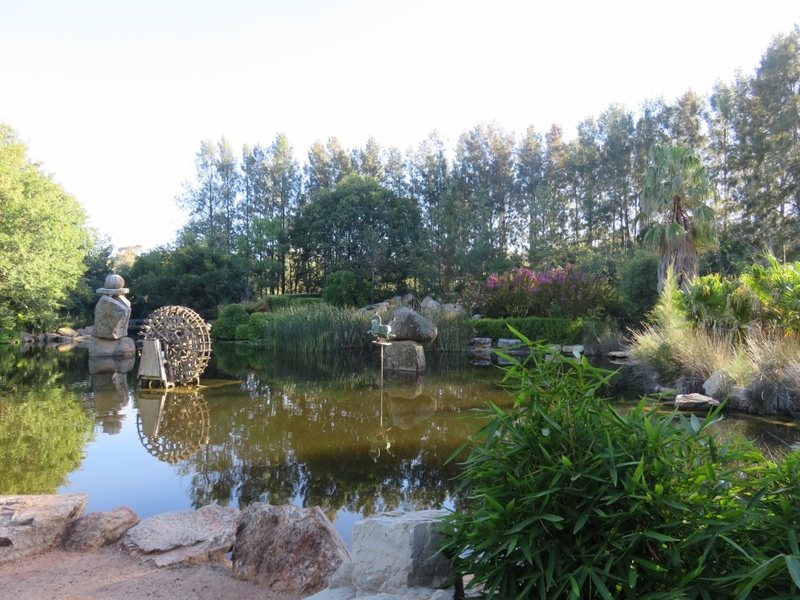 The very tranquil garden was quite a contrast to the Wombat eggs! Thanks Sylvia. It is nice to know there are places all over the world with Honesty Boxes. Yes, I bet those Wombat eggs could be confusing for some! It was really nice to see that a peaceful place could go back to being peaceful. I love Honesty Boxes, and I’ve heard there are plenty in Britain…I’m not surprised. 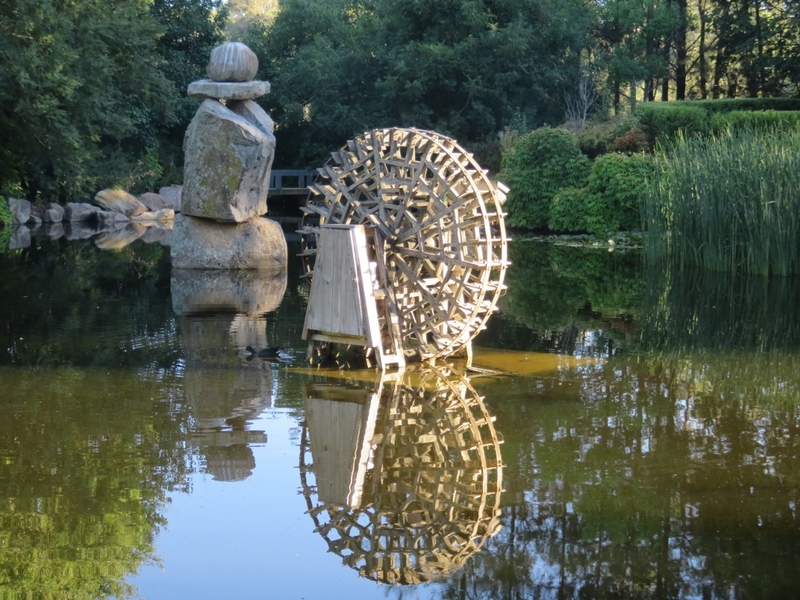 A beautiful garden and some interesting history. Gold rushes tend to bring out the worst in people. California’s was, if anything, worse. The garden was really lovely that morning. 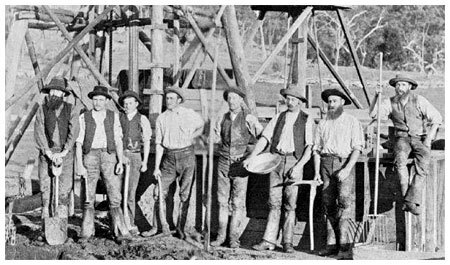 I think California and parts of Australia, have had very similar gold rush experiences. Thank you for sharing this peaceful garden, Gerrie. Community gardens are so special; all those different groups of people working together to make something beautiful. I think they have made peace with the land now, after the horrors of the gold rush. Thanks Clare, I agree that community gardens are special, and there is no doubt the land is more peaceful now…a hopeful sign in the modern world too. Yes, I liked the way the whole community had worked together to build this memorial garden.